There are lots of things that I love about playoff hockey. And although I’m a little disappointed with all the nasty play and dirty hits and the lack of respect that some players *coughraffitorres* have shown for their fellow players, there is something about this time of year that makes my heart just fill up with joy and excitement. I love that I acutally have the opportunity to watch teams that I otherwise never get to see. Like the Nashville Predators, for instance. For years, I’ve been indifferent to them. I didn’t hate them, nor did I love them. They were just there. Existing in a Western Conference world that I just never visited. I respect Barry Trotz and his loyalty immensely. I give props to the organization being patient and slowly building an organization and a team that can compete with the big dogs of the NHL. 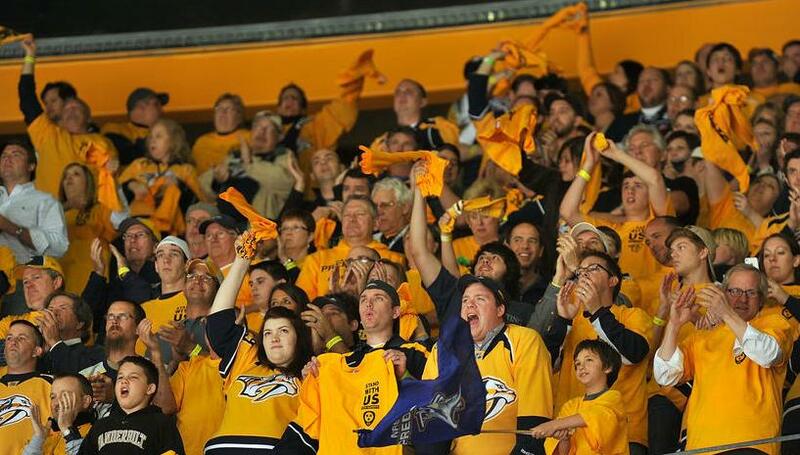 I makes me happy to see that the fans in Nashville have embraced this team and the sport of hockey. The Preds have made the playoffs 7 out of their 13 years of exsitance and last year, they even won their 1st ever playoffs series, defeating the Anaheim Ducks in the first round. Also that season, they had 16 regular season sell-outs and 6 sell-outs during the playoffs. 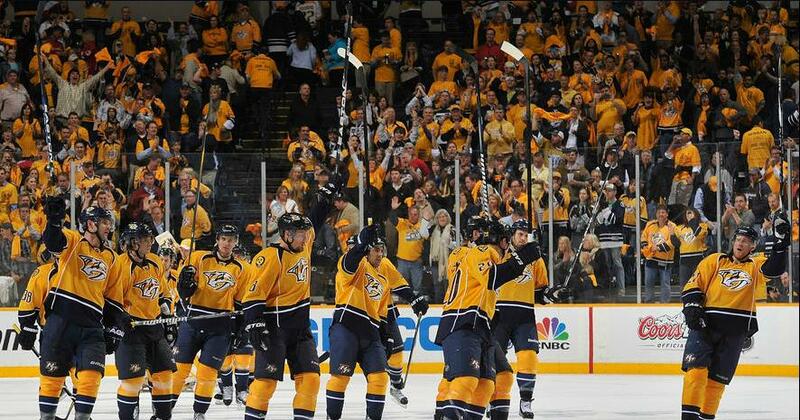 We love hockey almost as much as we love country music! Well, last night, I had the chance to watch the Preds take on the Wings in game 3 of their series. Although the Preds are seeded #4 to the Wings’ #5, you know this is going to be a tough series, but I’m really liking the Preds chances in this one. Pekka Rinne is a freak of nature a la Zdeno Chara and should not be as atlethic and quick as he is. He is 6’5″! He’s a goalie! It boggles the mind. They have some great young players, especially Gabriel Bourque, who scored this beaut last night. It also helps that the Predators have two Boston University Terriers on their roster – Brandon Yip and Foxy Friday honoree, Colin Wilson. As a tried and true Terrier, my blood runs scarlet and white and seeing two very talented former college players from my alma mater get the chance to play in the NHL makes me appreciate this team even more. So for the remainder of their playoff run, I’ll be rooting for the blue and gold, much to Gator’s dismay. She’s already mad at me because of the Bruins/Caps series and now this one, too. What can I say? I’m digging the Predators. Perhaps I’ll have to invest in NHL Center Ice next year, after all…. Tonight is the premiere of HBO’s 24/7 Flyers/Rangers: Road to the NHL Winter Classic. And since I’ve re-watched Game of Thrones into oblivion, I will be tuning in to get my $10 worth for December. The WUYS crowd won’t be as excited as last season – including me, since I actively hate both of these teams. But if anything can open my heart to the Rangers or Flyers, it’s 24/7. Remember last year? I was still trying to hate the Caps, exhausted from fighting my obvious fall from grace. 24/7 was the last nail in my Mike Green-shaped coffin. And now look at us. In 2010, the Pens and Caps storyline played great on TV – one team winning consistently and the other losing every game. This year, the Rangers and Flyers are both playing really well. The show should have a different flavor showcasing two teams at the top of their game. Both teams have marquee players on the injury list, most specifically Philly whose Claude Giroux went down last week. 24/7’s inclusion of injured players, the recoveries and attempts to get back on the ice really rounded out the show. I’m looking forward to that. What do you guys think? Excited? Max Talbot was a star last year, he’s back this season will the Flyers. Who will be the breakout personalities from this series, and will it be enough to make you care? We promise you won’t be bored if you play the Yahoo! Puck Daddy 24/7 Drinking Game, 2011 Edition. HBO show link is here for all your procrastinating pleasure. We work Jeffy pretty hard around here, what with all the photocopying and heavy lifting and runs to the store to get our supply of twizzlers and mexican coca-cola. But today, we decided to give him the day off. Because when you work THIS hard, you deserve it. Categories Like a Boss, Next Generation, Randomness, We Love, Well OBVIOUSLY. not looking at the hockey stick here. Ovi crashed the Caps rookie camp yesterday and skated with the newbies! He sported the fashionable black jersey with his named slapped on the back and skated along with all the other young bucks. 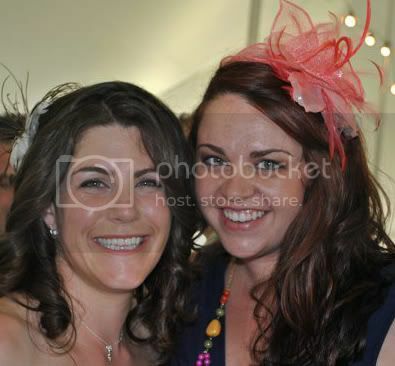 For being slagged as not so hands on (I protest & wish!) and for supposedly not being in shape – so not so – he seemed to not only keep pace with the teenagers, and yes, I said teenagers, at 25, eh hem, soon to be 26 – VERY SOON – to be 26. That would make some of them almost half his age! OMG. He’s an old man in hockey years! Get the cane out ladies! Can you believe that? The kids had a great first day at school and learned from the best. And a tale to tell years from now! My first day at rookie camp I got to skate with Ovechkin! I’d be more like, my first day at rookie camp, I got to shower with Ovechkin and well it would be nothing like Pant’s dream and there would be no laughing involved. I hope you ate you lunch already Pants! And just so you know ladies, he told everyone during his Bauer press conference, in case you missed it, HIS BODY IS PERFECT. So no worries about him being fat. And I have to agree. Not that I’m biased or anything. Let’s face it folks, it was only a matter of time before this post was going to happen. 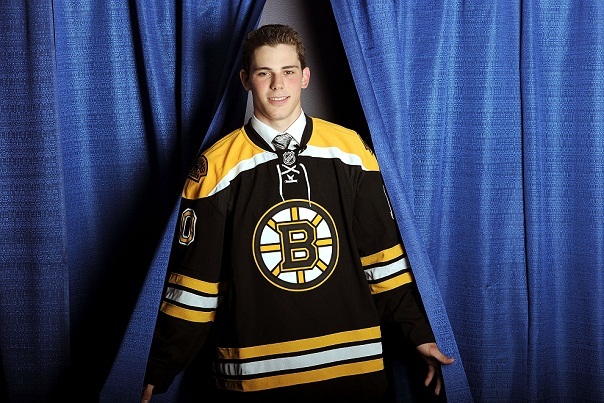 On Monday, Tyler Seguin was just a baby caterpillar in his little cocoon. On Tuesday, he emerged as a beauty butterfly with black and gold wings. "I'm gonna unleash "Magnum" on you right...NOW!" 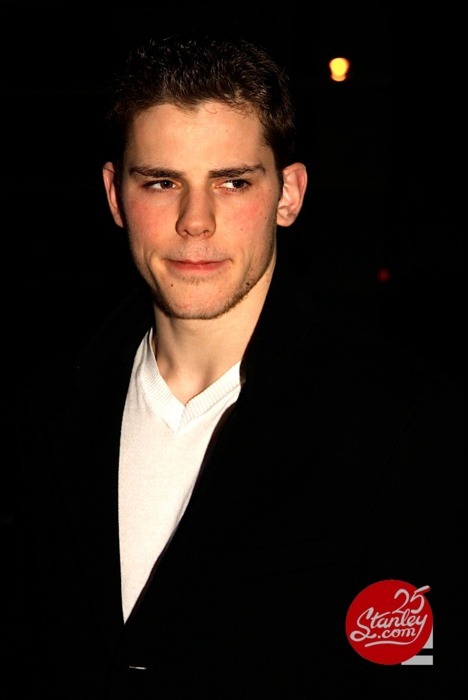 Seguin is this week’s Foxy Friday because he has left a #19-sized, werewolf-shaped stamp on the Bruins organization, its fans, and on the 2011 NHL Playoffs. 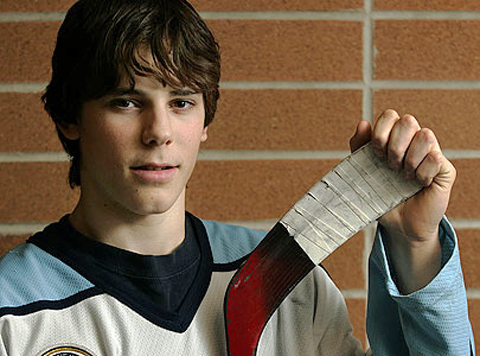 After not playing for the first two rounds of the playoffs, SeguinPenguin finally got the chance to show us why the Bruins selected him 1st overall in the 2010 Entry Draft. The 6’1″ Brampton, Ontario native stepped up like Channing Tatum in that dance movie and put on a show in Tuesday’s Game 2 vs the Lightning. In three career playoff games has 6 points (3 goals, 3 assists). Foxy. He scored two goals and added two assists in the 2nd period of game 2, which tied an NHL record for points in a playoff period & made the rookie just the fourth Bruin to accomplish the feat. Foxy…four times. He’s displayed awesome speed and a youthful exuberance that is a joy to watch. Foxy. 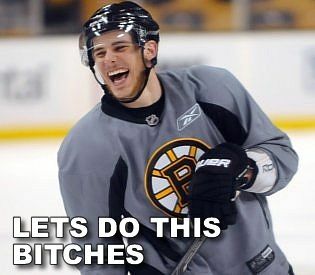 He even looks good in a hideous 1970’s budget Bruins jacket. Foxy. He makes an excellent iced coffee. Foxy. He’s ab-tastic and armed and dangerous. Foxy. Pants does not approve of your name tattoo...but she does approve of your muscles. 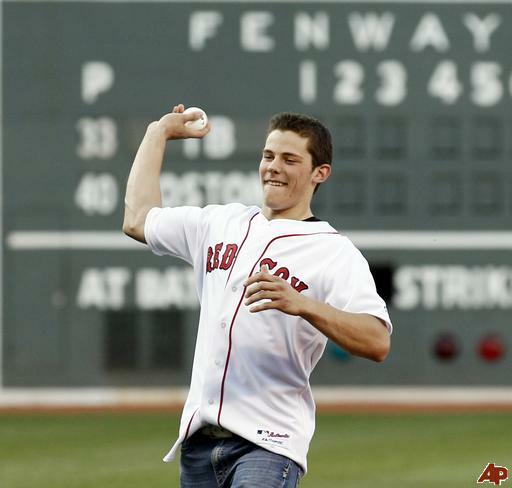 He looks awesome in a suit AND a Red Sox jersey. Foxy. I swear my mom DIDN'T pick this out for me. Apparently he is channeling “Teen Wolf” with his interesting choice of playoff facial hair. Foxy? Categories Chuck Loves, Foxy Friday, Hot Like Fire, Next Generation, Playoffs, Well OBVIOUSLY. Today has been a good day…despite the fact that it has been raining for 4 days straight and the sun is no where to be found. The reason it has been a good day is very simple. 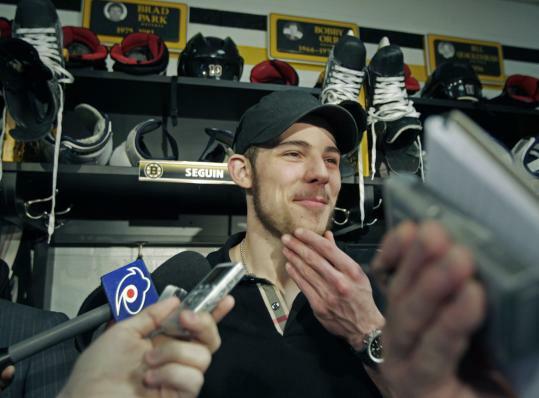 It is because of you that Bruins fans worldwide have that post-victory, dewy glow. We have an extra pep in our step. We smile easier. Food tastes better. Those emails from the office Dwight Schrute don’t seem as annoying anymore. In other words, you make the world a better, happier place. I think we all know who’s getting this week’s Foxy Friday honor…. Categories Chuck Loves, Hot Like Fire, Next Generation, Playoffs, Well OBVIOUSLY.